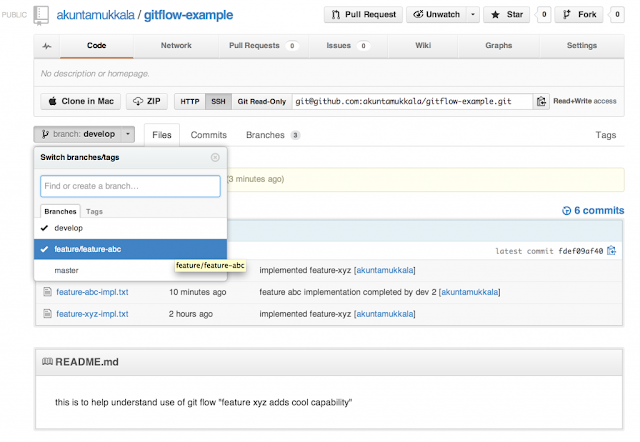 This is a gentle introduction to "git flow" using a hands-on example. In an typical Agile/SCRUM shop, there are several teams constituting of developers and QA personnel who collaborate across several sprint lanes. Their primary objective is to deliver functional user stories at the end of each sprint cycle. In such an environment of rapid iterative development, it is essential to have a very well defined strategy to branch, merge, tag, release, patch the source code repository. This can become problematic real fast especially when using DVCS such as GIT. Here is where "Git Flow" comes into play. 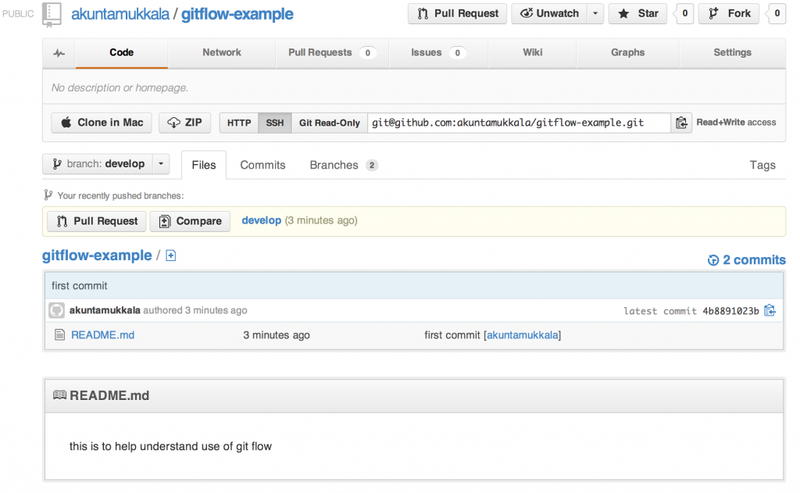 Git Flow is both a methodology and software (underneath the covers runs git commands). It takes the best enterprise practices we are familiar with in a centralized version control system and applies them to GIT. Here are 4 resources that I found really helpful while learning Git Flow. In this post, I'd like to share how two popular fictitious developers (Bob and Alice) use Git Flow to develop software collaboratively. Both have their own git repository and collaborate via central repository hosted on Github. 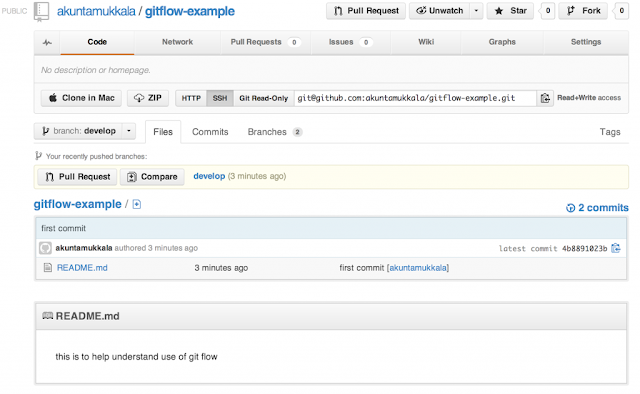 If you are reading about git flow, it is fair to assume that you are aware of basics of git and have used GitHub. 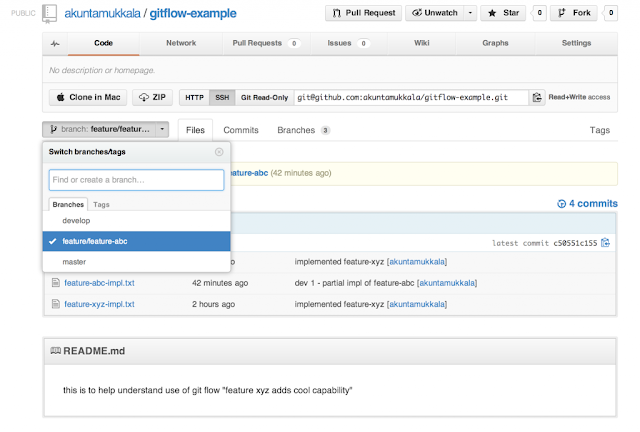 There are lot of blogs that go over git basics and how to install git and git flow. I'd suggest that you get a bit of hands-on experience with git and GitHub before reading further as it will help you follow along much easily. 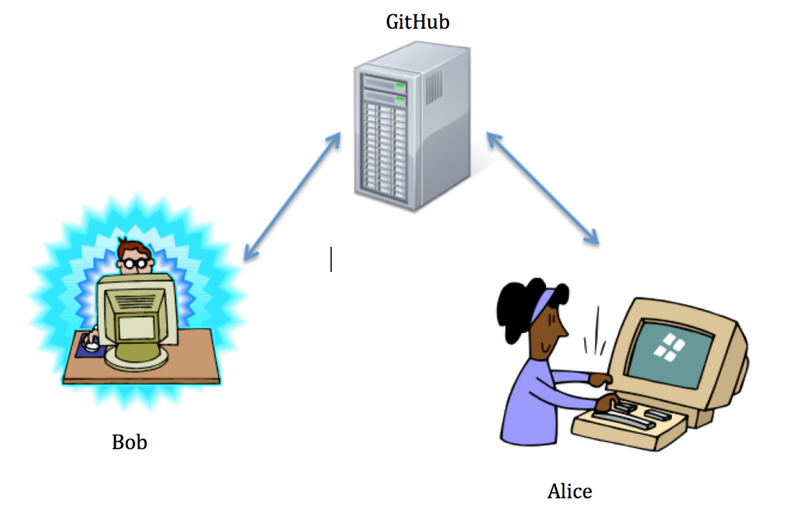 In this example, both Bob and Alice have read and write access to the same shared GitHub repository. Bob begins by creating a repo in Github called "gitflow-example"
Now that Bob has an empty repo on Github, he creates a local Git repo using gitflow and sticks to the recommended branch naming convention suggested by Git Flow. Ashwinis-MacBook-Pro:GitFlowExample akuntamukkala$ git add . Ashwinis-MacBook-Pro:GitFlowExample akuntamukkala$ git commit -m "first commit"
Writing objects: 100% (5/5), 430 bytes, done. Here is the screenshot of repository on Github showing both develop and master branches. Current active branch "develop"
Alice clones the gitflow-example.git repo from Github and initializes git flow on her local repository. She also sticks to the same branch naming convention recommended by Git Flow. 04/24/2013 02:49 PM <DIR> . 04/24/2013 02:49 PM <DIR> .. The following commands creates a branch "feature/feature-xyz" off the "develop" branch. C:\GIT\GitFlowExample\gitflow-example>git commit -m "implemented feature-xyz"
Now that Alice commits the newly implemented feature xyz to her local repository, it is time for her to merge her changes to the "develop" branch and delete "feature/feature-xyz" branch. Deleted branch feature/feature-xyz (was 02d1a06). Alice pushes her changes from "develop" branch from local repository to the "develop" branch on central repository on GitHub. Writing objects: 100% (4/4), 414 bytes, done. Say Bob and Alice now want to start developing a feature collaboratively. Bob creates a new feature "abc"
Bob implements feature "abc", commits changes to local repo's feature/feature-abc branch. 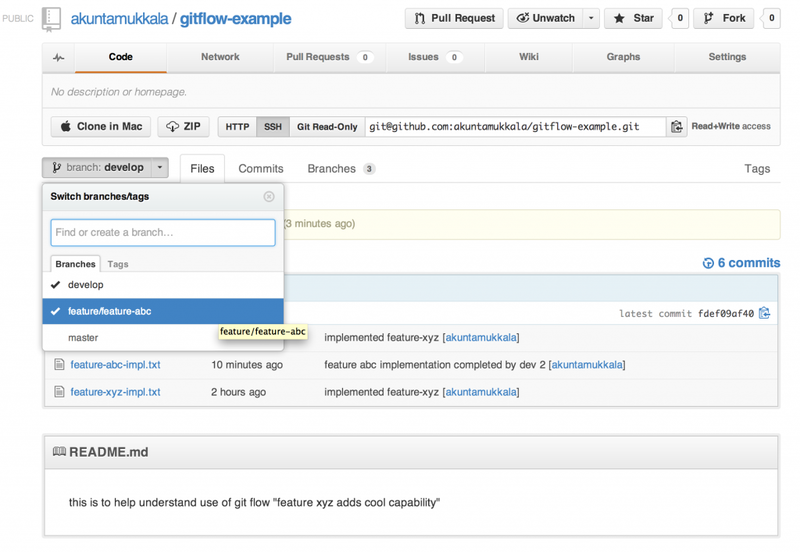 Ashwinis-MacBook-Pro:GitFlowExample akuntamukkala$ git commit -m "dev 1 - partial impl of feature-abc"
Bob now publishes feature-abc to repository on GitHub. Writing objects: 100% (3/3), 381 bytes, done. Created local branch feature/feature-abc based on origin's feature/feature-abc. 04/24/2013 04:25 PM <DIR> . 04/24/2013 04:25 PM <DIR> ..
Alice continues to implement feature abc. Alice finishes the implementation of feature "abc" and commits her changes to her local repository. warning: LF will be replaced by CRLF in feature-abc-impl.txt. C:\GIT\GitFlowExample\gitflow-example>git commit -m "feature abc implementation completed by dev 2"
[feature/feature-abc warning: LF will be replaced by CRLF in feature-abc-impl.txt. Now that this new feature abc is completely implemented, Alice figures it is time to merge changes from "feature/feature-abc" branch to the "develop" branch of her local repository. Branches 'feature/feature-abc' and 'origin/feature/feature-abc' have diverged. And local branch 'feature/feature-abc' is ahead of 'origin/feature/feature-abc'. Deleted branch feature/feature-abc (was 5671d9f). # Your branch is ahead of 'origin/develop' by 3 commits. Alice pushes changes from her local repository containing completed feature-abc implementation to the central repository on GitHub. Writing objects: 100% (4/4), 573 bytes, done. It may be noted that "feature/feature-abc" branch has been deleted in Alice's local repository but still exists in Github repository. Alice deletes feature-abc branch from Github repo. Bob updates local repo to get completely implemented feature "abc"
Bob needs to delete feature/feature-abc branch from local repo because his local repository's "develop" branch already contains the merged feature abc implementation. "git remote prune origin" command helps identify that remote branch (feature/feature-abc) that Bob was tracking has been deleted. Deleted branch feature/feature-abc (was c50551c). Now let's talk about making a release as both features "xyz" and "abc" have been implemented and tested. Branch release/release-1.0 set up to track remote branch release/release-1.0 from origin. Ashwinis-MacBook-Pro:GitFlowExample akuntamukkala$ git commit -m "release notes for release-1.0"
Writing objects: 100% (3/3), 347 bytes, done. Now that the release has been deemed successful, Bob proceeds to finish release process. Deleted branch release/release-1.0 (was 15af591). Your branch is ahead of 'origin/master' by 7 commits. Your branch is behind 'origin/develop' by 2 commits, and can be fast-forwarded. Let's say an urgent production issue has been discovered for which a fix needs to be made. Ashwinis-MacBook-Pro:GitFlowExample akuntamukkala$ git commit -m "critical hotfix#1 made"
Deleted branch hotfix/hotfix-1-release-1.0 (was 3d8b4ec). Writing objects: 100% (6/6), 674 bytes, done. Writing objects: 100% (2/2), 350 bytes, done. I hope that you found this helpful. 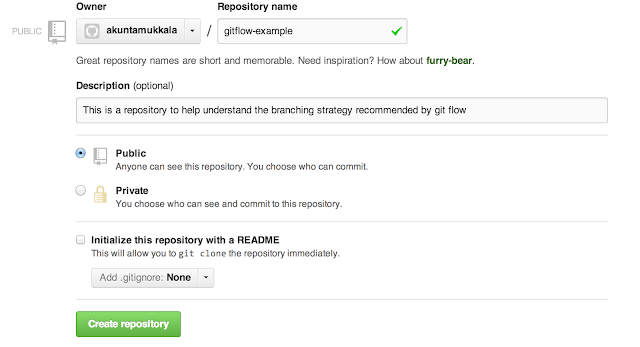 I am constantly looking for ways to improve my proficiency in git and git flow. If you find something that can be improved, please don't hesitate to drop in a comment.